Jana Downum is a doctoral student in the Saybrook University School of Mind-Body Medicine. Jana presented a case report at the Association for Applied Psychophysiology amd Biofeedback annual conference in Austin, Texas on March 11 to 14 (see http://www.aapb.org/i4a/pages/index.cfm?pageid=1). 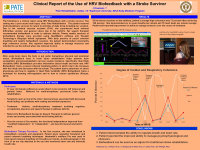 Jana’s Case Report, which was presented in poster form, demonstrated her effective use of heart rate variability biofeedback with one of her patients, a stroke survivor. Within the field of biofeedback, Heart Rate Variability Biofeedback is a promising new intervention technique. Jana introduced the techniques to the patient during their first session. In subsequent sessions, the patient practiced and regularly applied mindful breathing, and used HRV strategies outside of sessions in all settings. The poster presents the data, progress, and how the patient successfully achieved higher levels of difficulty within the HRV program. Jana has been a member of the Biofeedback Society of Texas (BST) for several years and has presented at prior Annual BST Conferences. She is a biofeedback therapist at Pate Rehabilitation, in the Dallas, Texas area.